When Orton Museum Director Bill Ausich and Curator Dale Gnidovec lead tours, they always report that their most enthusiastic patrons are in elementary school. “For every little boy in the back row pulling pigtails, there’s a little girl up front who knows more dinosaur names than I do,” said Ausich. The oldest free public museum in the state, Orton is home to many exhibits that celebrate the prehistoric. From a 7-foot-tall giant sloth skeleton to collections of meteorites and mastodon teeth, there’s plenty for kids to marvel over. But with the recent addition of an entire dinosaur skeleton, molded from a fossil discovered by an Ohio State professor, enthusiasm and support for the museum is sure to increase exponentially. For more than 120 years, the Orton Geological Museum has played an important role in teaching, outreach and research, and the addition of a dinosaur skeleton in the building’s lobby is furthering the university’s land grant mission. Dinosaurs, after all, are the “gateway drug to science,” according to Ausich. Dinosaurs get kids excited about science for the first time. In addition to education and research, Ausich and Gnidovec see outreach to the area’s youth as a vital function of the museum. “We feel that this is a really important way to get people involved in science, which we desperately need today,” Ausich said. The mission to bring a dinosaur to Orton began in 1991, when Ohio State faculty member David Elliot was in Antarctica tracking volcanic ash deposits with the Byrd Polar and Climate Research Center. While on his lunch break, Elliot stumbled upon massive dinosaur bones, encased in rock and ice. Four field seasons later, Cryolophosaurus ellioti was free. A replica of the Cryolophosaurus ellioti skeleton was installed at Orton Hall on Sept. 18. According to Ausich, the location of Elliot’s discovery is hugely significant, proving not only that the Earth’s continents have shifted throughout time, but also that Antarctica was once much warmer than it is now. The dinosaur’s location isn’t the only significant thing about its discovery. Cryolophosaurus is unlike any other dinosaur discovered in Antarctica — or anywhere else in the world for that matter. “It’s a brand new species,” said Ausich. Although researchers have found “scraps” of dinosaur fossils in Antarctica in the past, Cryolophosaurus is the most complete dinosaur ever found in that region. Orton Geological Museum welcomes tens of thousands of visitors each year. Gnidovec gives dozens of talks throughout the year to children, college students, senior groups and museum patrons. The museum itself is utilized by a wide variety of groups across campus; biology majors, art students and paleontology fans alike visit to learn more about the history of Earth. To bring Cryolophosaurus to campus, the team at Orton raised the necessary funds through a crowdfunding campaign that drew donors from all over the world. This isn’t the first time the community has stepped up to support the museum. A 2012 vandalism incident prompted massive outpourings of support from across the country. Major donors and local patrons alike gave what they could, and Orton’s youngest fans even brought in their piggy banks to help save the museum. When it came time to raise money for Cryolophosaurus, these pre-school-aged fans (with the help of their parents) mobilized once again by dressing up as dinosaurs and selling cookies to raise awareness for the project on campus. Partnering with the community is really all about inspiring the next generation of scientists, according to Ausich. “We bring kids to campus. We let them think, ‘Wow, I could be a part of this place someday’” Ausich said. Recently, Orton was due for a massive renovation when the project ran into funding issues. Now, Gnidovec hopes that the addition of Cryolophosaurus will put the museum on the map and ignite future funding. “What better way to get the museum noticed than by a dinosaur?” Gnidovec said. The 24-foot carnivorous creature will certainly be difficult to ignore. The dinosaur is mounted in the museum’s lobby, positioned so he is staring down at visitors hungrily. 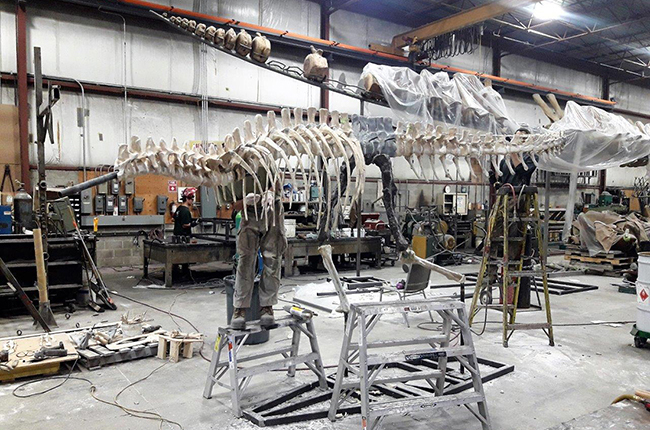 Orton partnered with Research Casting International (RCI), a Canadian company renowned for their dinosaur casts made for museum exhibits around the world. RCI made casts of Cryolophosaurus’ bones at their facility near Toronto, before assembling and mounting the skeleton in the lobby of Orton Hall. The next step of the planned renovation will incorporate technology into the museum’s exhibits, but won’t attempt to replace the magic of being able to see and touch physical specimen. On Oct. 7, the Sunday of Homecoming Weekend, the Orton team will host an open house for alumni and friends to welcome the museum’s newest addition. Register here.